The first thing I do right before I am about to build any custom cabinets is a story pole. It’s not real complicated I just find a stick of wood that’s as long as the longest measurement on my custom cabinets and I’ll just take my tape measure and just sort of start laying out where the parts of the custom cabinets are going to be. 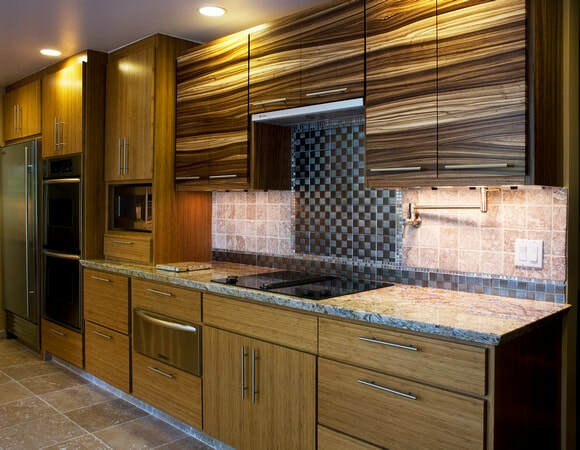 For custom cabinets that we’re going to build you need a vertical layout and then we two horizontal layouts because the upper cabinet is a little bit narrower than the base cabinet. We call it a step back cabinet. It’s really kind of a neat detail that gives me a chance to add some more trim and I’m all about adding trim. So I have the story pole here in front of me. All I have done to the story pole is layout each size of each measurement I need for my custom cabinets. I first went by and measured out all of my vertical measurements and then flipped it over to do all of my horizontal measurements. I have a four inch rail at the bottom and I’ve come up a little and I’ve got an inch and a half rail where my drawer is going to occur and then the top rail is two inches and I’ve even marked in here where my plywood tops going to be and then because these custom cabinets step back I also have a rail that’s at the bottom of the upper bookcase piece and then a rail at the top. That is how I prep my story pole for my custom cabinets.